Objectives: To evaluate the relationships of the diabetes on the quality of life, being used questionnaire Diabetes 39 to patients diagnosed like diabetics who go ambulatory visit to health centers. 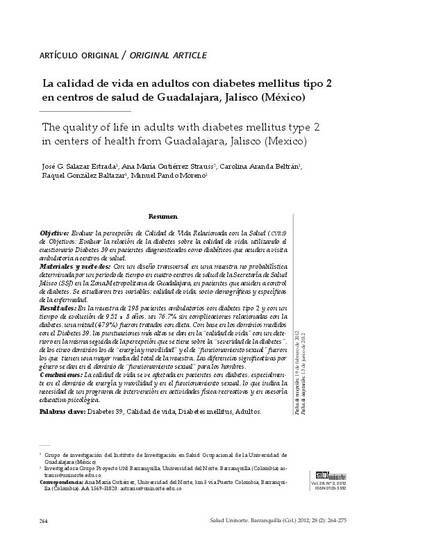 Materials and methods: With a transversal design in a nonrandom sampling determined by a time period in four centers of health of the salubrity secretary was made (SSA) in the Metropolitan Zone of Guadalajara, in patients attending diabetic control. Three variables were studied: quality of life, socio-demographics and the disease specific. Results: In the sample of 198 ambulatory patients with diabetes type 2 iand with a duration of 9.51 ± 8 years, 76,7% without diabetes-related complications, one half (47.95) were treated with diet. Based on the dominions measured with Diabetes 39, the highest scores occur in the dominion of “quality of life” with a followed deterioration in their lives and in their perception about the “severity of the diabetes”, of the five dominions those of “energy and mobility” and the one of “sexual operation” was those that they have a greater average of the total of the sample. The significant differences by gender differences exist in the domain of “sexual performance” for men. Conclusions: The quality of life is affected in patients with diabetes, especially in the dominion of energy and mobility and in the sexual operation, which indicates the necessity of a program of intervention in physical-recreational activities and educative-psychological consultant’s office. The greater negative impact of the diabetes in the quality of life was associated with man, low entrance to the average and with presence of complications by the diabetes.